There are 5 levels of Membership available, please refer to the Join page. Please read and accept the Terms and Conditions before joining. You will also need to enter billing information and payment information in order to complete your membership payment. Your membership access will not be confirmed until a successful payment has been received. You will receive email on your membership confirmation from Fantasy Racing Tips. If not, please check your Junk/Spam email folder. If you would like to change your membership level in order to gain access to additional content on our site, follow these simple instructions. 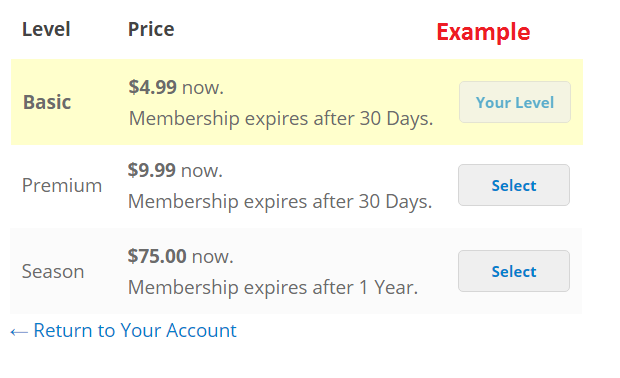 The instructions also apply if you are interested in downgrading your membership level. You will be brought to the join membership page. 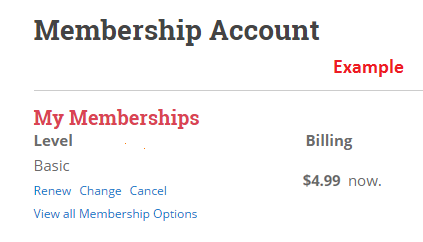 scroll down and you can see your current membership level and other available membership levels. Select a new membership level. After that you will be directed to a checkout page in order to complete your membership payment similar to the process when you join membership. Your new membership level will not be confirmed until a successful payment has been received. Please note that there is NO Prorated Amounts and NO Refund on your previous membership. Select Cancel and then confirm on the cancellation. You will receive email on your membership cancellation from Fantasy Racing Tips. If not, please check your Junk/Spam email folder. If you are a member, you have not login yet. If you are a member and you have login, your membership level does not include that access or your membership is expired or cancelled. 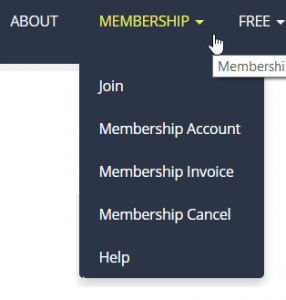 Check the Join page or Membership page for what are included in your selection of membership level, or check your membership expiration date on Membership Account page. If you are not a member, you are accessing member only post or post for a specific membership level. Go to Join membership. You are performing a search and there is no result found that matched with your search entry. If you are a member and you have login, your membership is expired or cancelled. Scroll down to New Password and Select Generate Password. You will see the a defaulted password is entered , the password can be changed. You can also choose to hide or show the password. Select Update Profile once you satisfy with your new password. After that you will receive an email notification . Please check your Junk/Spam email folder if you are unable to see the email. Login and go to Profile (side bar) or Edit My Profile (top right bar). Scroll to E-mail Required and entered your new email. You will receive an email for you to reset the password shortly. Follow the direction. Please check your Junk/Spam email folder if you are unable to see the email. If you are not a member, Go to Join membership.